A brave effort in front of the home crowd in the Queen Elizabeth Stadium on the evening of Friday 25th May but for the host association’s Doo Hoi Kem and Lee Ho Ching it was defeat at the semi-final stage of the Women’s Doubles event at the Seamaster 2018 ITTF World Tour Hang Seng Hong Kong Open. The no.3 seeds, they suffered at the hands of China’s Chen Ke and Wang Manyu, the no.5 seeds (14-12, 11-5, 10-12, 9-11, 11-7). Defeat against a lower ranked pair but the result could not be considered an upset. 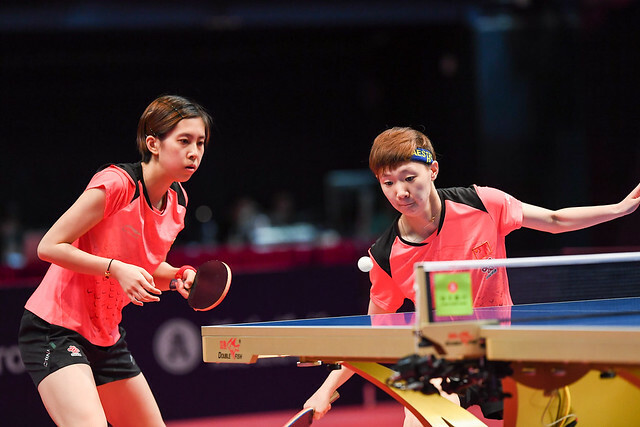 China’s Chen Ke and Wang Manyu have two ITTF World Tour Women’s Doubles titles to their credit; they won in 2014 in Korea and earlier this year in Qatar. Success for Chen Ke and Wang Manyu; it was the same verdict for Chen Xingtong and Sun Yingsha; the no.4 seeds, in the penultimate round they accounted for Japan’s Hina Hayata and Mima Ito, the top seeds (11-4, 2-11, 11-7, 12-10). Thus for a third time this year Chen Ke and Wang Manyu meet in Chen Xingtong and Sun Yingsha in an ITTF World Tour Women’s Doubles final. Chen Xingtong and Sun Yingsha won in Hungary. The decision was reversed in Qatar, in Hong Kong we await the verdict. The Women’s Doubles final is scheduled for the afternoon of Sunday 27th May.